Sunday, June 1–We had the honor of attending the graduation ceremony at Shanti Bhavan Residential School in the countryside east of Bangalore. The protagonists of this day were the kids, raised since age 3 inside the caring campus founded by Abraham George, who also founded the Indian Institute of Journalism and New Media. Shanti Bhavan offers free education and housing to kids of poor families, transforming them into members of the business community in Bangalore and other parts of the world. The ceremony went well, with performances and speeches, followed by a delicious lunch. After hours of celebrating what seemed like the epitome of a good philanthropic cause, however, our team came to a realization: The music, sarees and smiles had been overshadowing our journalistic curiosity. 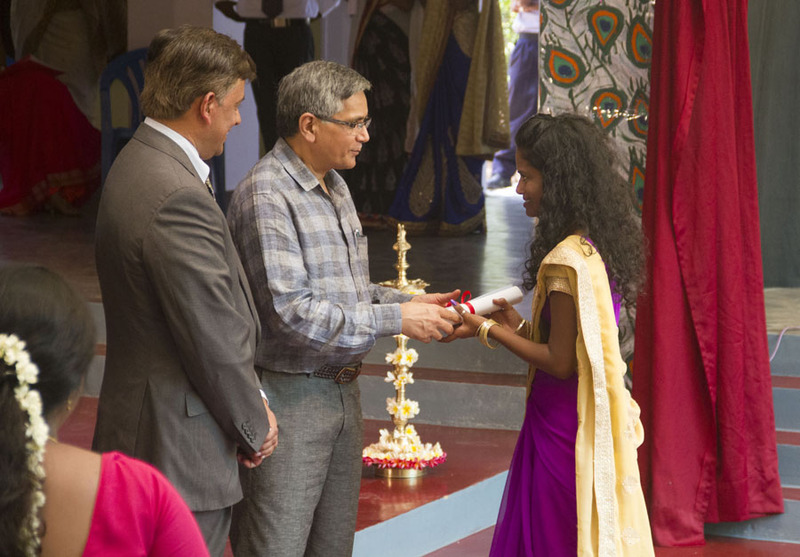 Shanti Bhavan was unlike any other school we’d seen either in India or America, and we were stunned by the warm welcome we received from the time we entered the wrought iron gates. Students of all grades greeted us and ushered us onto the school grounds, introducing themselves and getting acquainted with us as though we were long-lost friends. As graduates, family and friends assembled for the graduation ceremony, a choir sang Hindu religious songs. Two batches of young adults were celebrated, the college batch who were moving on to higher education, and university graduates moving on to jobs in large companies such as Goldman Sachs and Exxon Mobile. The desperately poor families of these children, we were told, sent them to the school seeking a better future for them. The trade off: cutting off contact with their youngsters except for twice a year when their children could return home for a week or two for vacations. The school provides all resources: clothes, food, shelter, love. Shanti Bhavan is like a home away from home for all of the students, and the students seemed to feel they lacked nothing. The ceremony celebrated the accomplishments of the graduates and recognized their strength and perseverance. It was hard not to feel a deeply personal connection to every one of them. 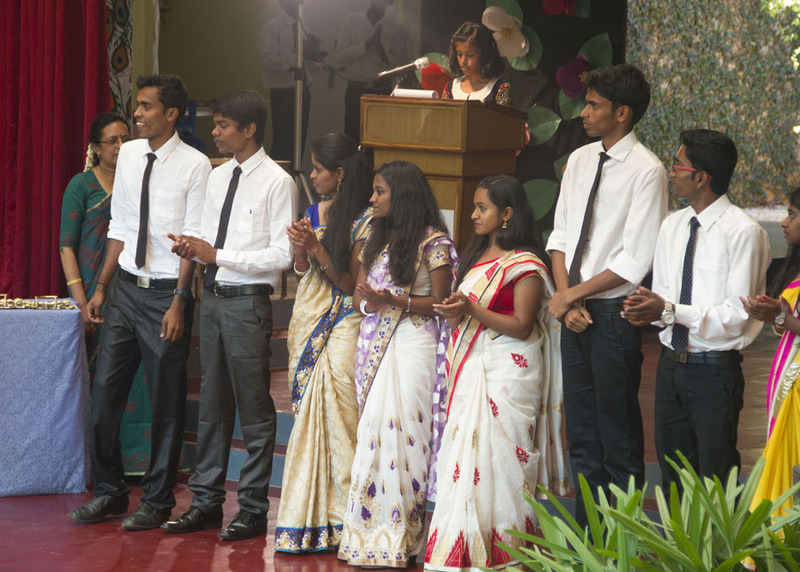 The graduation ceremony at Shanti Bhavan was not unlike your typical June graduation in the United States—long and hot. The central area where the ceremony took place was open to the sky, except for netting to keep birds out. The sun beat down, and for a break from filming the event, I dipped into an art classroom on the first floor. Paintings hung on a string to dry, and drawings of fantastical creatures lay across the single-seat desks. The artwork mimicked a Western aesthetic, with little apparent inspiration from the Indian styles I had seen around Bangalore. I came across mixed-media pieces that used cutouts of the glamorous female models found in everyday American magazines. All the students I met at Shanti Bhavan were extremely polite, well-spoken and confident. The moment we arrived, I met Hannah, a 16-year-old wearing a bright yellow top and blue pants, who used the word “awesome” just like I do. Hannah led me down a path lined with coconut trees and green space, pointing out the dorms and other school buildings on our way to the graduation site. Shanti Bhavan seemed almost too good to be true. In fact, when I was interviewing the woman who handles public relations for the school, even she said that people say that. But according to her, it is all true. The school is something really amazing for these children, but to me, it seems a bit extreme. One of the 11th-grade girls told me they never leave the campus. They do not go out to dinner, they do not go to the mall. While this school is a really great experience for these children, I cannot help but think that they are missing out on other essential parts of life. This entry was posted in Blog and tagged Abraham George, Ajit George, dalit, education, JWWIndia, Shanti Bhavan. Bookmark the permalink.